The primary principle of keyhole cranial surgery is to maximize surgical efficiency by minimizing approach-related disruption while maintaining optimal ability to safely perform the operation. Keyhole cranial approaches include the supraorbital, mini-pterional, keyhole subtemporal, retrosigmoid, pineal, transventricular, and transcortical approaches. Keyhole approaches require careful preoperative planning to determine the optimal surgical trajectory with careful evaluation of normal and pathological anatomy. The endoscope can be an invaluable tool in keyhole approaches to increase illumination along the surgical corridor and look around structures that cannot be mobilized. 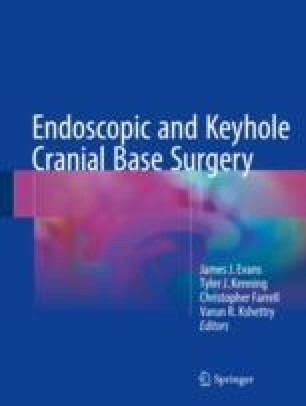 In this chapter, we discuss the principles of keyhole cranial surgery and highlight nuances regarding individual keyhole approaches.